Oswald the Lucky Rabbit was not stolen from Walt Disney. That's one of those popular "everybody knows this is true" Disney myths that continues to this very day. Oswald couldn't have been stolen from Walt, because Walt did not own the character. Universal Pictures owned the character. An animated cartoon series featuring a rabbit character had been suggested by the founder of Universal, Carl Laemmle. The Universal Pictures publicity department had selected the name of the character by drawing it out of a hat filled with slips of paper with different names on them. Walt knew that Universal owned the character. He was not shocked about that fact when he had a meeting with Charles Mintz in February 1928 to try to negotiate for a slightly higher budget for each cartoon. Walt was well aware that he was just a freelance contractor who had been hired to do the cartoons. However, Walt was surprised that Mintz had signed Walt's animators to contracts and was going to set up his own animation studio in Hollywood run by Mintz's brother-in-law, George Winkler. The studio would produce any future Oswald the Rabbit cartoons. Mintz offered Walt a very high-paying job in the new studio. It was a job that Walt turned down because he would just be another Mintz employee with no control over the cartoons or the character. Walt was also surprised that Mintz had successfully convinced Universal Pictures that the cartoons would not undergo a slip in quality as a result of the switchover, because they would still be made primarily by Walt's own staff. More importantly, Mintz had told Universal that the second season of cartoons could be made for roughly the same price as the first season, not the higher costs that Walt wanted. While in New York for that fateful meeting, Walt had even met with Universal executives to try to get them to intercede on his behalf in his negotiations with Mintz. They were sympathetic to Walt's arguments but ultimately felt that Mintz, who was older and had more business experience, knew what he was doing. Over the years, Walt talked about how Oswald had been taken from him by the unscrupulous dealings of Mintz—and that is true. However, Walt's statements have often been misinterpreted to mean that something illegal had been done and Walt lost his personal property. It was not unusual for a studio to own the rights to its characters. Animation legends Chuck Jones (director) and Michael Maltese (writer) created some iconic characters, like the Road Runner and Wile E. Coyote and the skunk Pepe Le Pew. However, those characters, as they knew, were owned completely by Warner Brothers entirely, as were all the other classic characters they created while working there. Warners Brothers could, and did, have others do cartoons with those characters. There was no legal obligation to credit or compensate Jones and Maltese in any way. It was only decades after they originally did the work that Jones and Maltese started to receive any public recognition at all. Walt was just doing "work for hire" for Mintz, who had a deal with Universal to provide animated cartoon shorts featuring Oswald for the studio to distribute. Walt definitely felt that because of all the time and effort that his studio had invested in the 26 cartoons to make Oswald a success that he was owed some greater consideration. Morally, that might have been the case, but there was nothing illegal in the proceedings. As they still say today, "it's not personal; it's just business." Mintz took the opportunity to make this change just before a new contract was signed. In addition, Mintz was already in control of Ben Harrison's and Manny Gould's Krazy Kat production house in New York and enjoyed being in a position to be able to control the character and the production costs. As far as Mintz was concerned, Walt was a troublemaking maverick who didn't understand business realities and wasted time and money on unnecessary improvements. In addition, he knew that many of Disney's key staff (who were roughly the same age as their boss) disliked Walt's authoritarian manner. Mintz felt that Walt's contributions were valuable and had helped make the cartoons a success. However, he felt that Walt needed to be brought under control to maximize profits. After all, Mintz reasoned, as so many others did over the years to their great regret, that since Walt was not actually drawing the cartoons, he was not the real secret of the success of the product. It was the artists who were the key to the magic. It is also important to remember that if Walt had had his contract renewed to keep making Oswald cartoons that there never would have been a Mickey Mouse. Oswald may have eventually developed into a character similar to Mickey, but it wouldn't have ever been quite the same. "I always felt that the Mickey Mouse cartoon The Barn Dance (1929) could very easily have been an Oswald cartoon," said noted cartoon authority David Gerstein. "Mickey is portrayed as an Oswald-like fall guy who—uncharacteristically for Mickey—loses in the end, to Pete no less!" It was Mickey's personality based on Walt himself that made him not only a star like Oswald (who appeared in 194 short cartoons), but a genuine cartoon superstar like the early Felix the Cat. So, rather than reviling Mintz as a villainous businessman, we may all owe him a debt of gratitude. By not renewing Walt's contract, it forced Walt to come up with something better and allowed Walt autonomy over his studio and its films. However, I do love those first 26 Oswald cartoons made by Walt. There is a rough energy and humor in them that easily matches the best efforts of many of the popular live action contemporaries who were entertaining theater audiences. 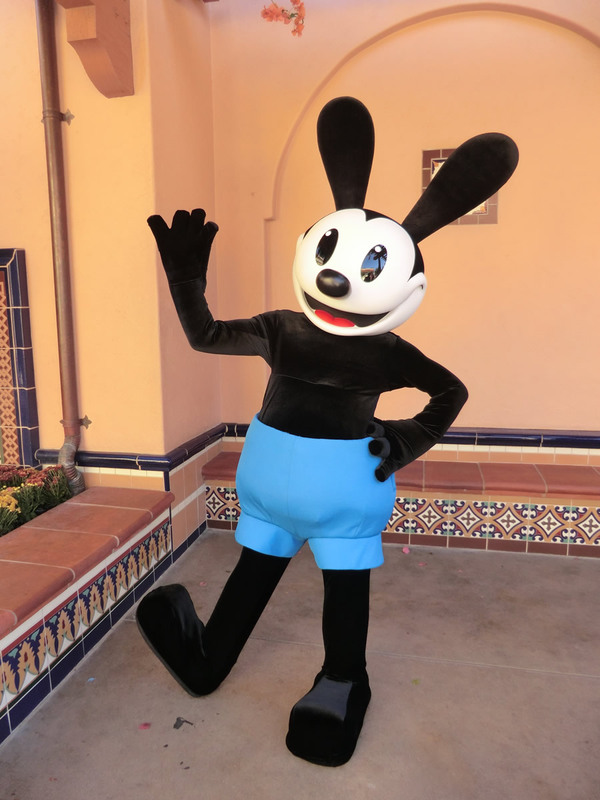 I was thinking about Oswald lately because a costumed character Oswald has recently debuted at Disney California Adventure (DCA) and, once again, there are rumors that the Disney Company might make a significant effort to revive and reintroduce the character for the general public. Oswald greets visitors at Disney California Adventure. Photo by Adrienne Vincent-Phoenix. In addition, on my last trip to DCA, I was looking through the Oswald merchandise at the front of the park and a young kid pointed at a display and asked his parents innocently "Who's THAT character?" The parents were unable to explain. A helpful cast member nearby happily chimed in, "That was Walt Disney's first character but it was stolen from him. He's like an early Mickey Mouse." Well, there is much more to that story. So, to help well-meaning cast members, and other Disney fans, understand the importance of the character, I thought I would briefly share some background history on Oswald. Walt Disney's animation career actually began in Kansas City, Missouri, where he produced a series of short Laugh-O-Gram cartoons that took classic folk tales like Little Red Riding Hood and Cinderella, and updated them to a Jazz Age sensibility. Unfortunately, Walt's lack of business acumen resulted in the company going bankrupt after just seven silent cartoons being produced. Thankfully, all seven of those cartoons exist today, with the remaining three that were lost for decades finally being located in 2010. In a desperate attempt to save his animation studio, Walt did several experiments including a "sing-a-long" short and an animated film that combined a live action girl with animated characters. That film, Alice's Wonderland, caught the eye of film distributor Margaret Winkler when Walt sent it to her. Winkler had been the secretary of Harry Warner at the Warner Brothers studio and with his encouragement became a cartoon film distributor. Officially, she represented herself as "M.J. Winkler," so that people would think she was a man. That "J" stood for nothing. She just added it because she thought it looked better. She was barely 28 years old when she signed Walt Disney to produce the Alice Comedies. She was distributing two cartoon series: Pat Sullivan's Felix the Cat and Max Fleischer's Out of the Inkwell. Fleischer was going to be setting up his own studio and the mercurial Sullivan was currently unhappy with Winkler and had some outrageous demands for a new contract. So, Winkler was on the verge of losing her only two cartoon series when she contacted Walt. That's one of the reasons the Alice Comedies feature a black cat (Julius). Winkler felt his role could be expanded if Sullivan did not renew his contract and took Felix the Cat away. Sullivan eventually did renew the contract in 1924, but opted out in 1925. As David Gerstein notes, Winkler indeed demanded Disney expand Julius' role at the time. Winkler also launched a new licensed series built around Krazy Kat, another popular black cat character she could utilize in Felix's absence. The Disney Brothers Studio was formed in 1923 to produce a series of silent Alice Comedies cartoons featuring little 6-year-old Virginia Davis interacting with cartoon characters and backgrounds. That series is the true beginning of the Disney animation empire. Fifty-seven cartoons in the series were produced, and it was so successful that both Walt and Roy could afford to get married and build houses for themselves. In 1924, Winkler married Mintz (who had been working for her since 1922), had a baby and retired from the business. Her new husband took over and his hardheaded business approach resulted in several confrontations with the Disney Brothers. Where Winkler had been supportive of the Disney Brothers, Mintz was highly critical that the cartoons were not of a high enough standard for him. In later years, Walt admitted in an interview that his desire for high standards was cultivated through his interactions with Mintz. The last Alice Comedies featured less and less live action, and more and more animation as Walt's animators gained in expertise. Walt felt the "gimmick" of live action/animation in the series had run its course and was losing favor with the audience. However, because of the popularity of Walt's cartoons, in 1927, Mintz was able to sign a deal with Universal to produce a new cartoon series, which was to star a rabbit character. It was Carl Laemmle himself, the founder of Universal, who said that there were too many darn cats in cartoons, like Felix and Krazy, as far as he was concerned. He wanted to see a rabbit. The name "Oswald" was reportedly selected by P.D. Cochrane, the head of Universal's publicity department. He gathered suggestions from the staff around the office including the secretaries and put them all into a hat and drew out a name. Walt would later tell his daughter Diane how the name was literally drawn out of a hat at random which is why Oswald didn't follow the animation and comic strip convention of alliteration in a name, like Mickey Mouse, Bugs Bunny, Pink Panther and others. Universal had not released a cartoon series in years, and began to promote Oswald with extensive and enthusiastic advertisements in the trade press. Although the odd-looking white rabbit in their earliest ads had not the slightest resemblance to the final Ub Iwerks black rabbit design. Universal did a marketing push on merchandise, as well, including a 5 cent chocolate-covered marshmallow candy bar made by the Vogan Candy Corporation of Portland, Oregon. The Philadelphia Badge Company issued a button with Oswald (the precursor to today's pin collecting). Universal Tag and Novelty Company offered an Oswald stencil set for drawing the character. The Disney Studios saw no royalties from any of this merchandise, which didn't bother Roy O. Disney who said, "We are a movie studio not a toy store." The Disney Brothers were happy that the merchandise brought attention to the character so that audiences would ask theaters when they would be showing another Oswald cartoon. In any case, any merchandise profits would have gone to Universal who owned the character and the cartoons. Winkler suggested to her husband that Walt and Roy should be ones to make the series. Mintz offered Disney the contract to produce the new series, and Walt jumped at the opportunity. Almost every artist at the studio submitted different rabbit designs. Iwerks had been experimenting with a new way of designing characters for animation using circles which were easier to animate. If you look closely at the last few Alice Comedies, the ears of the mice got longer and more pointed as Iwerks practiced with how to move rabbit ear shapes. Disney sent Mintz the group of test drawings for the new character, and Mintz selected and approved one. It was copyrighted for Universal. Disney was given approval to produce the first cartoon for the new character, who was to be known officially as Oswald the Lucky Rabbit. The pilot, titled Poor Papa, was criticized by Universal executives because the Oswald character was not cute or likeable enough. In fact, Gerstein has described the character as looking and behaving like "Farmer Alfalfa" from the Paul Terry cartoons with the same type of grumpiness and dumpiness of a stereotypical rural hick. The memo from Universal included the phrase: "With the exception of Chaplin, important movie comedians are neat and dapper chaps." The Oswald that Iwerks had originally designed had overalls, jowls and a scruffy shape in keeping with the plot of the cartoon. In the story, Oswald was overwhelmed with a multitude of newborn children. The concept, Gerstein told me, was decided upon before the character's species was nailed down but it was ideal for a rabbit character, given the belief that rabbits had a tendency to multiply abundantly and quickly. This was a storyline Walt would refine for a later Mickey Mouse cartoon titled Mickey's Nightmare (1932). After viewing Poor Papa, Mintz advised Disney to redesign the character so he was "young and snappy looking with a monocle." While Universal had declared that Poor Papa was "unrelease-able," when Mintz later took over the series he was forced to release Poor Papa in an attempt to keep up with the deadline schedule set by Universal. Disney's head animator, Iwerks ignored Mintz's suggestion for adding a monocle but refined Oswald's appearance so that he appeared younger and more vital. In fact, this new design had many of the same design elements that we associate with the early Mickey Mouse. As the series progressed, Oswald became more and more the prototype for Mickey. However, Oswald was always a little "rougher" in behavior and more anatomically flexible, able to pop off parts of his body like Felix the Cat and utilize them in a variety of ways. The second Oswald cartoon, Trolley Troubles, was acceptable, and was previewed on July 4, 1927 to terrific reviews in the trade press. Its official premiere date was September 5, at which point it went into wide release. Motion Picture World gushed that: "Oswald series has accomplished the astounding feat of jumping into the first-run favor overnight." Trolley Troubles was inspired by the very popular comic strip Fontaine Fox's Toonerville Trolley. Oswald is the long-time conductor on this hometown trolley car that becomes a runaway threat careening up and down hills. There is a scene where Oswald removes his foot and rubs himself for luck. Animation legend Friz Freleng animated it. "And I was questioning, 'What do I show when his foot's taken off, do I show a bone in there or what?' And Walt joked about it and of course, he never thought of it either. Nobody had thought of it," groused Freleng in an interview late in his career. Why did Oswald rub himself with his foot? It never seems to occur to anyone that Oswald is a "lucky" rabbit because he has four lucky rabbit feet. Carrying a rabbit foot was a lucky charm for folks in those days. The custom lasted through the 1950s when the novelty feet were sometimes colored in a variety of shades like green or orange to increase sales. And, yes, you could actually feel the foot and the claws underneath the hair. The level of craftsmanship and storytelling continued to improve in the cartoons which also began to increase the cost of the cartoons. The animators began to rely less and less on model sheets as a reference for tracing poses. As a result, the animation began to have a more fluid style. Another change was that, although the storyboard method was still years in the future, the shorts began to be scripted with story sketches to indicate posing and gags. Several gags in the cartoons were later re-done in early Mickey Mouse cartoons. In fact, Walt's script for Steamboat Willie references a gag from the Oswald cartoon Tall Timber. Even Peg-Leg Pete popped up occasionally as a villain for Oswald as he had early menaced Alice in the Alice Comedies. Walt divided his animation staff into two separate units so that two pictures could be produced at once. One unit included Ub Iwerks and Friz Freleng. The other unit was headed by Hugh Harman and Ham Hamilton. The Oswald cartoons ran at the prestigious Colony Theater in New York. It was the same theater that would showcase the debut of Mickey Mouse because the owner was familiar with the quality of the Walt Disney Oswald cartoons. In 1928 with the popularity of Oswald increasing, Disney went to New York to approach his distributor, Mintz about an increase in his budget. Walt hoped the increase in budget would allow for more improvements. Mintz not only refused, but he actually told Disney to accept a 20 percent cut in the budget, or Universal, which was the legal owner of the series, would produce it on its own using Walt's own animators, who had signed contracts with Mintz. Legend states that only the loyal Iwerks refused to sign a contract with Mintz. In actuality, Les Clark (later to be known as the "Mickey expert" and one of the fabled Nine Old Men) and Johnny Cannon also refused to sign. So that left Walt with only a staff of three animators, two of whom who might be considered just apprentices. Disney also refused to sign a contract and formally walked away in March 1928, boarding a train to Los Angeles after sending his brother Roy a telegram assuring him that everything was all right. To fulfill his current contract, Walt still had to make three more Oswald cartoons with the "renegade" animators who would be leaving in June for the new studio. Walt tried to push those through production as quickly as possible, while Iwerks was separated and hidden from the rest of the staff so he could work on the first Mickey Mouse cartoon. Mintz gave the series to his brother-in-law, George Winkler, to produce in a new studio. Winkler Studio was renamed Mintz Studio in 1929. The first Oswald cartoon produced by Winkler was High Up released July 23, 1928, released roughly four months before the debut of Mickey Mouse. The story of these "lost" cartoons made by Winkler have been recounted by David Gerstein. Next time, I will share how Oswald was handled by Mintz and later Walter Lantz, Disney getting back Walt's Oswald, and why we should be very, very thankful that any of Oswald's silent cartoons still exist at all. As I recall, the rabbits feet that were popular for a brief time in the 80's where a hard plastic/enamel and weren't made from actual rabbits.